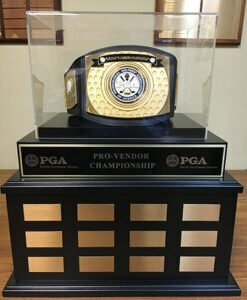 Back by popular demand, the Pro-Vendor Championship returns this October. This year’s event will be held at The Home Course on Monday, October 22. The 8:30 AM shotgun start will give professionals and golf reps some quality time to play together before the vendors move into Greater Tacoma Convention and Trade Center for the Merchandise Show. The cost is just $80 per team and includes lunch and range balls. Your evening is free to finish moving in or enjoy dinner with your friends/customers at one of the many fantastic restaurants in the Tacoma area. The winning team will get their names etched on this fabulous trophy, and the winning vendor will get to show it off at their booth! Last year, PGA Professional Greg Manley from Meridian Valley CC and Mike Sica from TaylorMade Golf won the Pro-Vendor Invitational with a four-ball score of 63. The Home Course was designed by golf course architect Mike Asmundson of Scottsdale, Arizona and opened on June 29, 2007. It is a walkable layout with panoramic views of Puget Sound, the Olympic Mountains, and Mount Rainier present throughout the golf course. The Home Course was selected by the United States Golf Association as the assisting course for the 2010 U.S. Amateur Championship. It is truly a great championship golf course at the home of golf in the Pacific Northwest. We hope you join us for the Pro-Vendor Invitational!